Farm Pride, a free range eggs supplier, is inviting people to see exactly how free range its eggs are in its latest outdoor campaign by displaying real footage from one of its farms on Melbourne Emporium’s new mega-screen. 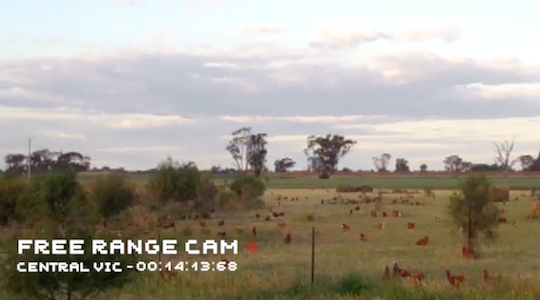 The real-time video feed of the farm in central Victoria started streaming this afternoon on the Swanston St screen and will continue until midday Friday. The campaign, via GPY&R and Ooh! Media, aims to show Melburnians that Farm Pride has ‘nothing to hide’ by giving everyone a glimpse into exactly what its farms look like and how its hens live. The video feed is also available for viewing on Farm Pride’s website. Farm Pride marketing executive, Sarah McLeod, hopes the campaign will show people “exactly why the eggs are so good”. “At a time when there is confusion among consumers about packaging claims, we felt it was important to demonstrate, that our hens produce 100% free range eggs in certified free range farms,” said McLeod. While there is still controversy about the definition of free range, the RSPCA has said free range eggs are those that come from hens with access to an outdoor area during the day, and shade, shelter and protection from predators at night. Australian supermarkets have made decisions in the last few years to stop selling caged eggs. In 2013, Woolworths made the call to eliminate all caged eggs by 2018 from its own house brand and from third patry suppliers. In 2013, caged eggs made up 50% of all eggs sold at Woolworths. Coles brand eggs are now 100% cage free, but this doesn’t apply to eggs from other suppliers. McDonald’s Australia has also made the decision to move to cage free eggs by the end of 2017.